Our guest today is Amanda Hall, an award-winning illustrator of many children’s books, including The Fantastic Jungles of Henri Rousseau and Brother Giovanni’s Little Reward (forthcoming). In addition to her book illustrations, Hall exhibits her original illustrations at Chris Beetles Gallery, St James’s, London. For this edition of Five Questions, Hall wrote about the joy — and the challenge — of creating art about one of her favorite artists, Henri Rousseau. What interested you most about Rousseau and his art? What features of his art did you think were most essential? As I wrote in my Illustrator’s Note in The Fantastic Jungles of Henri Rousseau, “I first saw Henri Rousseau’s paintings when I was sixteen. It was as though someone had turned on a light in my head, a light that shone on something I recognized or remembered. 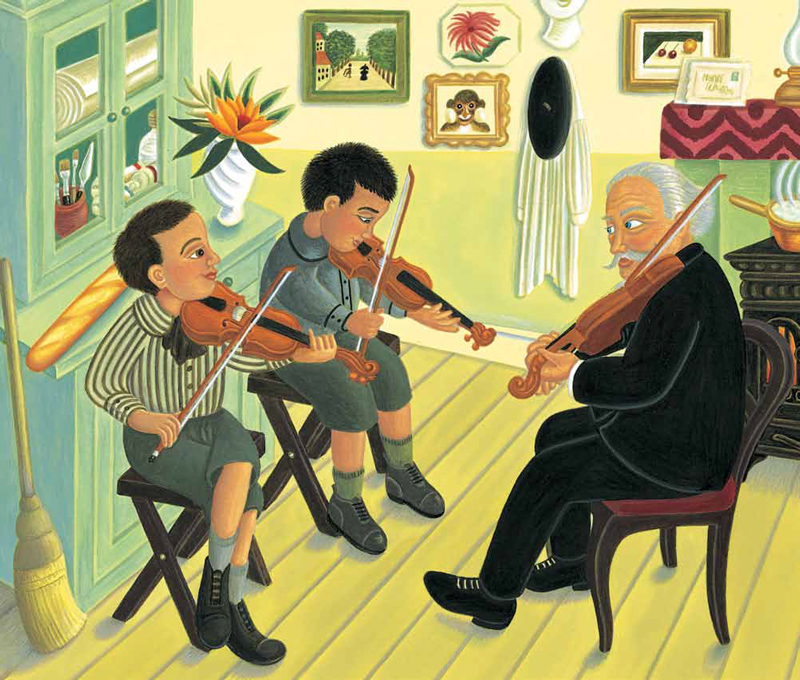 . . .” Imagine my delight, then, when Eerdmans Associate Publisher and Art Director Gayle Brown first contacted me with Michelle Markel’s text to ask whether I would like to illustrate her children’s biography about the artist’s work! Up until then, most of the books I’d illustrated had been stories from different cultural traditions, often timeless tales from many parts of the globe. I have always enjoyed getting under the skin of the subject I am illustrating, researching the imagery of each culture I cover. Working on The Fantastic Jungles of Henri Rousseau, though, was a special challenge, as it was the first artist’s biography I had been commissioned to illustrate and it was set in a very specific period of French history. Are there any ways your natural artistic style overlaps with Rousseau’s? My sixteen-year-old self must have taken something of Rousseau’s imagery in very deeply, just when I was embarking on my training at art school. What was it I responded to and absorbed from Rousseau’s work — his clean lines, his rich, vivid colors, his outlandish play with scale? It was all of those elements, but the overriding joy of Rousseau’s work for me was to do with the tangible magic he conjured up. Rousseau’s paintings describe a dream world, an alternate reality, but in such a graphic way that you feel you could walk right into it. I have always been striving to capture that quality, where appropriate, in my own art, and maybe this has given my work a flavor of Rousseau on an unconscious level. This book was the perfect opportunity for me to explore that quality. What features of his art did you think were most essential? Michelle’s beautiful and moving text took me straight to the heart of the matter, giving me both the stimulus and the space to respond creatively. I wanted to reflect those important aspects of Rousseau’s work I have already mentioned that I had absorbed a lifetime ago, but I wanted to study his work again in far more detail than I had done at sixteen. Before I embarked on my initial rough ideas for the book, I was lucky enough to go to Paris for a few days in the spring of 2010. I spent some time walking around Paris, following in Rousseau’s footsteps, not only taking in places that were specific to his paintings like Le Jardin Des Plantes and Grande Galerie de l’Evolution – with its amazing procession of stuffed animals — but also soaking up the wonderfully formal design of Paris itself. I noticed that every tree and bush is pruned into a tidy, formalized shape — so unlike London, where there is far more unplanned chaos. That kind of French detail found its way into my illustrations. I read a great biography of Rousseau, in a section of The Banquet Years by Roger Shattuck, a book that deals with la belle epoque and vividly describes the many famous, creative people Rousseau knew later on in his life. I used this book as a bible; it gave me so much insight into his life and personality. I got my hands on everything written and visual I could that was going to be relevant to my task. What unique elements of your own artistic style did you bring to this book? My storyboard came together in a fever. Inspired by my research, I felt licensed to take visual risks — like Rousseau had — in a way I hadn’t so far attempted in my career. I felt creatively stretched by the challenge to find the most arresting solutions for each illustration. I didn’t feel that I was straining to imitate Rousseau’s style; instead I felt released to illustrate in the way I had always wanted to do naturally. Six of the illustrations — including the cover and endpapers — refer in part to Rousseau’s actual paintings. The other illustrations needed to have the same visual feel to give the book stylistic continuity. Wherever I could, I included research. For example, I found archive photos of his apartment to base my images on, as well as some of the people he knew; it was fun to pull all this information together and interpret it in my own visual style. What features of his art did you think needed to be modified or “translated” for children? This was to be a book for children, although about an adult. Rousseau had lived a difficult life, but Michelle’s writing makes his story poignant and accessible for young readers. A lot of Rousseau’s art is strongly appealing to children; his animals, for instance, look like magical toys with their staring eyes. (I have seen big prints of his jungle paintings up on children’s bedroom walls.) I also made sure that I included the children Michelle had described in her text: in one picture Henri is seen teaching two boys how to play the violin and in another, “Henri gives the shiniest, reddest apples to the children.” I wanted Rousseau himself to look unthreatening, which is why I made his head larger than life-sized — he seems more lovable that way. Were you nervous or intimidated to be making art about a famous artist? I don’t think I felt intimidated by this task, but nervous, yes! This was my first picture book for Eerdmans, so I had no idea about their expectations, although I already knew that they like their artists to have their own creative input. So I sent my completed storyboard off to await their comments and held my breath. The reception I got was positive; they seemed to like my visual flights of fancy. After going on to develop detailed roughs for each page, I began the color artwork. This was another learning process. Up until that point in my career I had worked mainly in watercolor ink and pencil crayon, but I knew that wouldn’t be right for this book; it had to be paint. I toyed with the idea of using oils, but finally opted for a combination of watercolor inks and acrylics as a more practical solution, since oils take so long to dry. I hadn’t used acrylic paints before, but soon got used to them. I was really pleased with the vividness of the paints and the strongly graphic effect they can produce. I felt that I had made the right choice of materials for this book. The artwork took many months of meticulous work to complete, especially the illustrations where I got closest to Rousseau’s own paintings — The Sleeping Gypsy and The Hungry Lion Throws Itself on the Antelope. Illustrating this book was a labor of love for me; The Fantastic Jungles of Henri Rousseau has been a turning point in my career, setting me firmly on the road to illustrating books that I love wholeheartedly. The whole experience of working on such a great text with Gayle and the others at Eerdmans — who gave me so much creative scope — was a total pleasure. It’s a book I will always be proud of, and I owe a lot to Henri Rousseau’s fearless spirit! 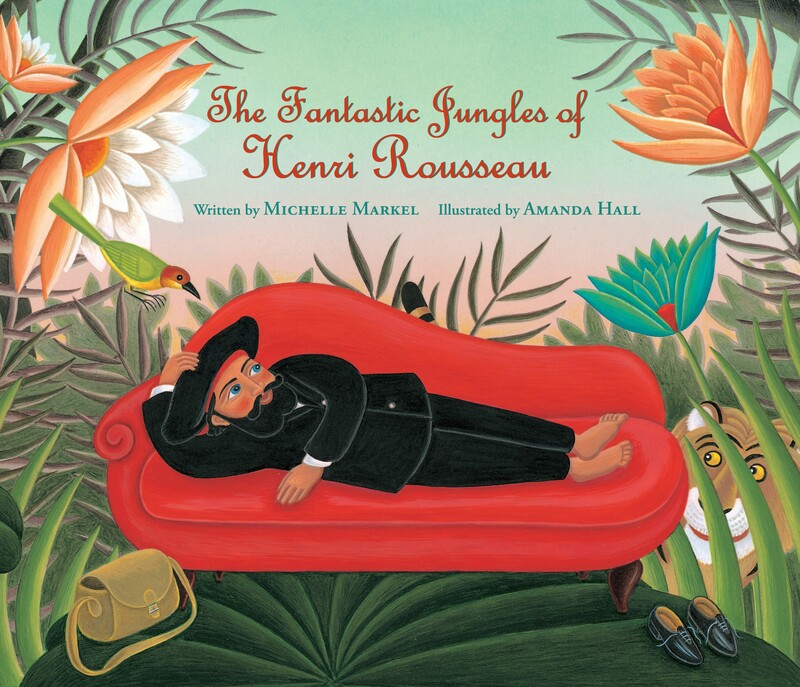 Learn more about Amanda Hall on her website, and click here to order The Fantastic Jungles of Henri Rousseau.